The audiences you need to reach with your digital marketing message are more savvy than ever. No longer satisfied with hearing from you in traditional ways, they have touchpoints with you across countless media channels—many of them highly personalized to their tastes and content preferences. Knowing how and where to engage your audience with a consistent stream of relevant, persuasive content has become an integral skill demanded of anyone working in digital marketing. 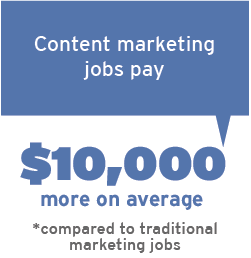 The high level of specialization required to do this effectively is the reason employers struggle to find qualified content marketing experts. Content marketing expertise builds upon your existing marketing skill set, launching your career forward while keeping you at the forefront of the digital marketing industry. It’s time to prove your content marketing skill to the world. Created in collaboration with industry leaders, the 3 course Certificate in Content Marketing not only teaches you the fundamentals of strategy and technical expertise, but it also gives you the opportunity to work on real-world projects with actual companies. 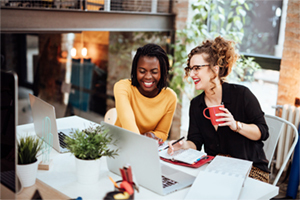 You’ll have the chance to practice the core job skills top employers demand when hiring content marketing professionals and graduate with a portfolio of project work, which you can use to land your next job. This knowledge, paired with your portfolio of project work, puts you ahead of the pack for your next job. It’s the closest thing to your career going viral. We know that fitting continuing education into your schedule isn’t easy. So, we make it easier by offering a flexible study format that works around your commitments. The Certificate in Content Marketing is a 6-month part-time program, taken mostly online. You’ll come to our Keele Campus in Toronto, ON for 3 weekends over the course of the entire program. This format allows you to easily balance your studies with your work and home life. 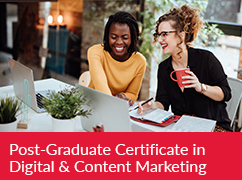 The Certificate in Content Marketing is ideal for anyone who currently works in marketing, or is a writer or creator of media. Jill is Senior Director, Content Strategy in the Office of the CEO at RBC, where she helps convene and inform national conversations on economic and societal issues facing Canada, focusing on innovation, diversity, sustainable economic growth and the coming skills revolution. Prior to joining RBC, Jill led the creation of a multi-channel, insights-driven thought leadership strategy at The Bank of Nova Scotia. Previously, she led an international team at a global travel brand, delivering award-winning communications, digital media and content marketing strategies. Jill spent the better part of her early career at The Globe and Mail, coaching multiple teams to success in a variety of senior roles. As Executive Editor, she drove strategic direction and development of innovative initiatives and products with a focus on audience growth and engagement, data-driven insights and digital platforms and partnerships. She currently sits on the Board of the Canadian Club Toronto and the Advisory Board at York University’s School of Continuing Studies. Jill holds an Honors BA degree from McGill University and a post-graduate degree in Journalism from Concordia University. Cora leads an advertising agency devoted to thoughtful food and beverage brands. She has led the agency through a transition to take a content first approach, strengthening the digital and social chops across all roles within the agency, including establishing an in-house content studio. The agency provides a full range of strategic, creative and digital services to its clients. Serving leading brands and fast-growing innovators, Bob’s Your Uncle is recognized as one of Canada’s premier boutique agencies. Previous to BYU, Cora co-founded Canada’s first Influencer marketing agency where she helped launch brands like General Mills, Walmart Canada, Finish & Lysol into the social sphere. For over 10 years, Alex has worked in the field of content marketing in financial services; helping educate Canadians to understand the best products and services for them. 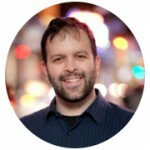 As a veteran storyteller, he promotes the value of tailored and targeted content as part of any top-notch marketing experience, across any industry. 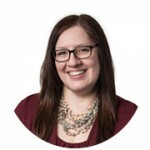 Justine Melman is a seasoned consumer marketer with almost two decades of experience delivering cutting-edge marketing, user engagement and social media campaigns for major global and Canadian brands including Holt Renfrew, The Globe and Mail, eBay Canada, Ally, Yahoo! Canada and Cineplex. Justine also brings a transformative perspective to the customer experience, helping brands implement and evolve their CX strategy. Justine was a 2015 nominee for the American Marketing Association’s Marketer on the Rise award. 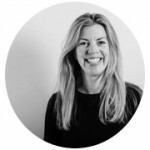 Rebecca Shevel is a dedicated and innovative Marketing Director, Media and Advertising leader with +20 years of experience growing brands, audiences and revenue. She has done this by developing relationships, creating multi-platform marketing, content & strategic advertising solutions. Rebecca’s approach is to be consultative, strategic and holistic with her clients and team. Rebecca passions include content marketing, digital media and emerging technology. 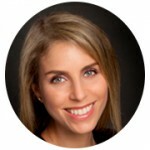 She has extensive experience working directly with clients (B2B & B2C), boutique and national media agencies. Rebecca brings a unique view when solving business challenges, having worked on the media supplier and agency sides of business. Rebecca enjoys helping define KPIs for clients to ensure the recommended strategy is fully supported by the best content, marketing and digital tactics. Rebecca has worked with and for numerous Tier-1 brands in a variety roles. Currently, she is the Director of Marketing and Custom Solutions at Fifth Story, working with the Account Directors to help create an array of content marketing and digital solutions for clients; while also focused on building the Fifth Story brand via partnerships, sponsorships, PR and targeted marketing. Michelle Cody’s bio will be posted soon. 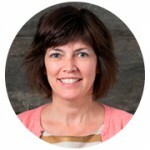 Head of Sales & Partnerships, Pelmorex Corp.
Tami Coughlan’s bio will be posted soon. Justin da Rosa is a lifelong storyteller. 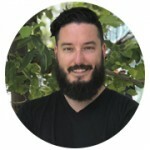 With a degree in professional writing from York University, he plied his craft as a journalist for five years before becoming a content marketing manager. He currently works as the managing editor for Ratehub.ca, a fintech startup in Toronto that aims to help Canadians make better financial decisions. When not managing Ratehub’s content department he freelances as a writer, helping brands tell their stories. Shelley is well-known for her expertise in content marketing. She has been a featured speaker at numerous Canadian and international marcom events. 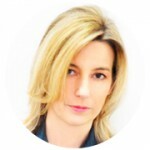 ​ Shelley has over twenty years of experience in media, marketing and communications. Prior to joining Fifth Story in 2012, Shelley held senior leadership roles at Postmedia, The Globe and Mail, CBC, Rogers and Brunico Communications. 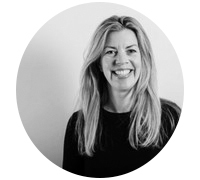 Shelley has experience with both B2B and B2C markets and in multiplatform media channels. She developed and managed large brand sponsorships programs for the Olympics and TIFF, and has launched and developed start-up brands in Canada and internationally. 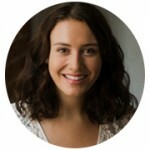 Rachel is a Senior Content Marketing Specialist at Borrowell – one of Canada’s largest financial technology companies. Rachel specializes in financial literacy initiatives and is passionate about helping Canadians better understand their credit. Rachel started her career in media and received her Bachelor of Journalism degree from the Ryerson School of Journalism. She completed multiple internships with prominent news publications, including stints at The National Post and The Canadian Press. Rachel was keen to jump into the Toronto startup scene and joined a fast-paced digital marketing agency, Atlas Communications, before graduating. She developed engaging website, blog, and social media content for well-known brands such as T-fal and All-Clad. Her learnings inspired her to instruct a social media workshop at The Cube School of Technology. In 2017, Rachel joined Borrowell to lead the company’s content and social strategy. Key responsibilities include driving website traffic, mapping the customer journey, and crafting engaging and delightful stories designed for a variety of platforms. Rachel recently completed her Search Engine Marketing certificate from Brainstation. Program policies will be posted soon. 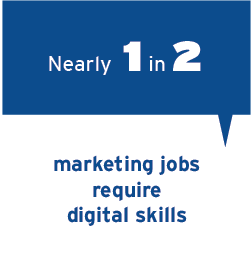 Add digital expertise to your existing marketing skill set. 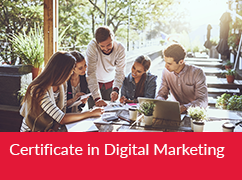 Gain in-depth digital marketing knowledge and skill, from fundamentals through to advanced applications.